Map of Washington, D.C., with Georgetown highlighted in maroon. Georgetown is a historic neighborhood and a commercial and entertainment district located in northwest Washington, D.C., situated along the Potomac River. Founded in 1751 in the Province of Maryland, the port of Georgetown predated the establishment of the federal district and the City of Washington by 40 years. Georgetown remained a separate municipality until 1871, when the United States Congress created a new consolidated government for the whole District of Columbia. 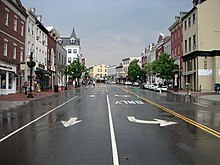 A separate act passed in 1895 specifically repealed Georgetown's remaining local ordinances and renamed Georgetown's streets to conform with those in the City of Washington. The primary commercial corridors of Georgetown are the intersection of Wisconsin Avenue and M Street, which contain high-end shops, bars, restaurants, and the Georgetown Park enclosed shopping mall. The Washington Harbour waterfront restaurants are located at K Street, between 30th and 31st Streets. Georgetown is home to the main campus of Georgetown University and numerous other landmarks, such as the Volta Bureau and the Old Stone House, the oldest unchanged building in Washington. The embassies of Cameroon, France, Kosovo, Iceland, Liechtenstein, Mongolia, Sweden, Thailand, Ukraine and Venezuela are located in Georgetown. 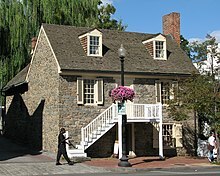 The Old Stone House, built 1765, is one of the oldest buildings in Washington, D.C. Situated on the Fall Line, Georgetown was the farthest point upstream that oceangoing boats could navigate the Potomac River. In 1632, English fur trader Henry Fleet documented a Native American village of the Nacotchtank people called Tohoga on the site of present-day Georgetown and established trade there. The area was then part of the Province of Maryland, an English colony. In the 1790s, City Tavern, the Union Tavern, and the Columbian Inn opened and were popular throughout the 19th century. Of these taverns, only the City Tavern remains today, as a private social club (the City Tavern Club) located near the corner of Wisconsin Avenue and M Street. Stoddert and other Potomac landowners agreed to a land transfer deal to the federal government at a dinner at Forrest's home in Georgetown on March 28, 1791. Stoddert bought land within the boundaries of the federal district, some of it at the request of Washington for the government, and some on speculation. He also purchased stock in the federal government under Hamilton's assumption-of-debt plan. The speculative purchases were not, however, profitable and caused Stoddert much difficulty before his appointment as Secretary of the Navy to John Adams. Stoddert was rescued from his debts with the help of William Marbury, later of Marbury v. Madison fame, and also a Georgetown resident. He ultimately owned Halcyon House at the corner of 34th and Prospect Streets. The Forrest-Marbury House on M Street is currently the embassy of Ukraine. 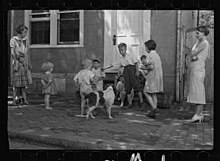 After the establishment of the federal capital, Georgetown became an independent municipal government within the District of Columbia, along with the City of Washington, the City of Alexandria, and the newly created County of Washington and County of Alexandria (now Arlington County, Virginia). 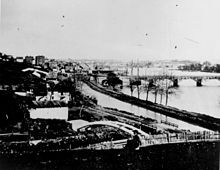 Georgetown around 1862. Overview of the C&O Canal, Aqueduct Bridge at right, and unfinished Capitol dome in the distant background. 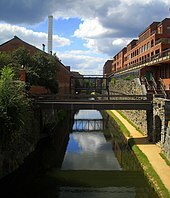 The Canal nonetheless provided an economic boost for Georgetown. In the 1820s and 1830s, Georgetown was an important shipping center. Tobacco and other goods were transferred between the canal and shipping on the Potomac River. As well, salt was imported from Europe, and sugar and molasses were imported from the West Indies. These shipping industries were later superseded by coal and flour industries, which flourished with the C & O Canal providing cheap power for mills and other industry. In 1862, the Washington and Georgetown Railroad Company began a horsecar line running along M Street in Georgetown and Pennsylvania Avenue in Washington, easing travel between the two cities. By the late 19th century, flour milling and other industries in Georgetown were declining, in part due to the fact that the canals and other waterways continually silted up. Nathaniel Michler and S.T. Abert led efforts to dredge the channels and remove rocks around the Georgetown harbor, though these were temporary solutions and Congress showed little interest in the issue. 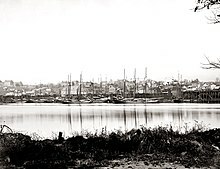 An 1890 flood and expansion of the railroads brought destitution to the C&O Canal, and Georgetown's waterfront became more industrialized, with narrow alleys, warehouses, and apartment dwellings which lacked plumbing or electricity. Shipping trade vanished between the Civil War and World War I. As a result, many older homes were preserved relatively unchanged. The C & O Canal, then owned by the Baltimore & Ohio Railroad, formally ceased operations in March 1924. After severe flooding in 1936, B & O Railroad sold the canal to the National Park Service in October 1938. The waterfront area retained its industrial character in the first half of the 20th century. Georgetown was home to a lumber yard, a cement works, the Washington Flour mill, and a meat rendering plant, with incinerator smokestacks and a power generating plant for the old Capital Traction streetcar system, located at the foot of Wisconsin Avenue, which closed in 1935, and was demolished in October 1968. In 1949, the city constructed the Whitehurst Freeway, an elevated highway above K Street, to allow motorists entering the District over the Key Bridge to bypass Georgetown entirely on their way downtown. Georgetown is home to many politicians and lobbyists. Georgetown's landmark waterfront district was further revitalized in 2003 and includes hotels such as a Ritz-Carlton and a Four Seasons. Georgetown's highly traveled commercial district is home to a variety of specialty retailers and fashionable boutiques. The Washington Harbour complex located on the Potomac River. Healy Hall is visible in the background. Georgetown is bounded by the Potomac River on the south, Rock Creek to the east, Burleith, Glover Park, and Observatory Circle to the north, with Georgetown University on the west end of the neighborhood. Much of Georgetown is surrounded by parkland and green space that serve as buffers from development in adjacent neighborhoods, and provide recreation. Rock Creek Park, the Oak Hill Cemetery, Montrose Park and Dumbarton Oaks are located along the north and east edge of Georgetown, east of Wisconsin Avenue. The neighborhood is situated on bluffs overlooking the Potomac River. As a result, there are some rather steep grades on streets running north-south. The famous " Exorcist steps" connecting M Street to Prospect Street were necessitated by the hilly terrain of the neighborhood. The primary commercial corridors of Georgetown are M Street and Wisconsin Avenue, whose high fashion stores draw large numbers of tourists as well as local shoppers year-round. There is also the Washington Harbour complex on K Street, on the waterfront, featuring outdoor bars and restaurants popular for viewing boat races. Between M and K Streets runs the historic Chesapeake and Ohio Canal, today plied only by tour boats; adjacent trails are popular with joggers or strollers. Georgetown in the 1850s had a large African-American population, including both slaves and free blacks. Slave labor was widely used in construction of new buildings in Washington, in addition to provide labor on tobacco plantations in Maryland and Virginia. Slave trading in Georgetown began in 1760, when John Beattie established his business on O Street and conducted business at other locations around Wisconsin Avenue. Other slave markets ("pens") were located in Georgetown, including one at McCandless' Tavern near M Street and Wisconsin Avenue. Slave trading continued until 1850, when it was banned in the District as one element of the Compromise of 1850. Congress abolished ownership of slaves in the entire District on April 16, 1862, annually observed today as Emancipation Day. Many African Americans moved to Georgetown following the Civil War, establishing a thriving community. Private schools currently located in Georgetown include Georgetown Visitation Preparatory School, while nearby is the eponymous Georgetown Day School. 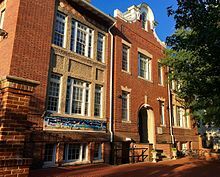 Georgetown Preparatory School, while founded in Georgetown, moved in 1915 to its present location several miles north of Georgetown in Montgomery County. District of Columbia Public Schools operates area public schools, including Hyde-Addison Elementary School on O Street. Hyde-Addison formed as a merger of two adjacent schools, Addison Elementary and Hyde Elementary, and has two entrances. The Addison section was renovated in 2008 while the Hyde section was renovated in Summer 2014. An addition connecting the two buildings is scheduled for completion in Summer 2019. Hardy Middle School and Wilson High School both serve Georgetown as zoned secondary schools. Duke Ellington School of the Arts, a public magnet school, is in the community. Healy Hall at Georgetown University. The Chesapeake and Ohio Canal passes through Georgetown. 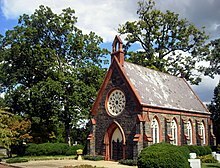 Oak Hill Cemetery Chapel, designed by James Renwick, Jr. in 1850, is listed on the National Register of Historic Places. The City Tavern Club, built in 1796, is the oldest commercial structure in Washington, D.C. The Chesapeake and Ohio Canal, begun in 1829. Dumbarton Oaks, 3101 R Street, NW, former home of John C. Calhoun, U.S. vice president, where the United Nations charter was outlined in 1944. The Forrest-Marbury House, 3350 M Street, NW, where George Washington met with local landowners to acquire the District of Columbia. Currently the Embassy of Ukraine. Healy Hall on Georgetown's campus, built in Flemish Romanesque style from 1877 to 1879 was designated a National Historic Landmark in 1987. Georgetown was home to Francis Scott Key who arrived as a young lawyer in 1808 and resided on M Street. Dr. William Beanes, a relative of Key, captured the rear guard of the British Army while it was burning Washington during the War of 1812. When the mass of the army retreated, they retrieved their imprisoned guard and took Dr. Beanes as a captive to their fleet near Baltimore. Key went to the fleet to request the release of Beanes, was held until the bombardment of Fort McHenry was completed, and gained the inspiration for " The Star-Spangled Banner". John F. Kennedy lived in Georgetown in the 1950s as both a Congressman and a Senator. Parties hosted by his wife, Jackie, and many other Georgetown hostesses drew political elites away from downtown clubs and hotels or the upper 16th Street corridor. Kennedy went to his presidential inauguration from his townhouse at 3307 N Street in January 1961. Pedro Casanave, the fifth mayor of Georgetown (who directed the construction and buried the Cornerstone in what later became in the White House on October 12, 1792), lived near of modern Delaware Avenue, in Georgetown. St. Elmo's Fire (1985) was set in Georgetown, though the campus fraternity row portions were filmed at the University of Maryland campus in College Park. No Way Out (1987) featured a Georgetown Metro stop as a plot device, even though no such station exists; the subway station shots were filmed in Baltimore, Maryland. Chase scenes for the movie were shot on the Whitehurst Freeway. ^ Delany, Kevin (1971). A Walk Through Georgetown. Kevin Delany Publications. ^ Lesko 1991, p. 1. ^ Ecker 1933, pp. 1-6. ^ Jackson, Richard Plummer (1878). The Chronicles of Georgetown, D.C., from 1751-1878. R. O. Polkinhorn. pp. 3–4. ^ Establishment and Government of the District of Columbia. U.S. Senate reports of 1900, Congressional Edition, Volume 4043, US Gov't GPO. January 1, 1901. p. 175. Retrieved January 16, 2019. ^ Lesko 1991, pp. 1-2. ^ Tindall, William (1901). The Establishment and Government of the District of Columbia. Government Printing Office. p. 15. ^ Ecker 1933, p. 8. ^ a b c d "An Old City's History: The Simple Annals of Our Venerable Suburb". The Washington Post. July 24, 1878. ^ Holmes, Oliver W. "The City Tavern: A Century of Georgetown History, 1797-1898". Records of the Columbia Historical Society. 50: 1–35. ^ Holmes, Oliver W. "Suter's Tavern: Birthplace of the Federal City". Records of the Columbia Historical Society. 73-74: 1–34. ^ a b Ecker 1933, p. 12. ^ Gutheim & Lee 2006, p. 49. ^ "A Century of Lawmaking for a New Nation: U.S. Congressional Documents and Debates, 1774 - 1875". memory.LOC.gov. Retrieved December 30, 2017. ^ "CHAP. 79.-An Act Changing the name of Georgetown, in the District of Columbia, and for other purposes" (PDF). United States Statutes at Large from August 1893 to March 1895. p. 679. Retrieved July 10, 2011. ^ Gutheim & Lee 2006, p. 58. ^ Gutheim & Lee 2006, p. 94. ^ a b Smith, A. Robert; Sevareid, Eric. "Washington: Magnificent Capital". Doubleday & Company, New York, 1965: 154, Library of Congress card number 65–24912. ^ Mitchell 1983, p. 2. ^ Gutheim & Lee 2006, p. 199. ^ a b "H-DC - H-Net". H-Net.org. Retrieved December 30, 2017. ^ Lesko 1991, p. 95. ^ "Old Georgetown Act". National Commission of Fine Arts. Retrieved December 9, 2008. ^ "The Ritz-Carlton Hotel and Residences, Georgetown". Architectural Record. Retrieved July 24, 2010. ^ Mitchell 1983, pp. 14-15. ^ Gutheim & Lee 2006, p. 51. ^ a b Lesko 1991, p. 2. ^ a b Mitchell 1983, p. 10. ^ a b ???. "Washington, DC--Mt. Zion Cemetery". cr.NPS.gov. Retrieved December 30, 2017. ^ Clark, Allen C. "Rev. Stephen Bloomer Balch, a Pioneer Preacher of Georgetown". Records of the Columbia Historical Society: 73–95. ^ " Elementary Schools" (2016-2017 School Year). District of Columbia Public Schools. Retrieved on May 27, 2018. ^ "DCPS School Modernizations Hyde-Addison Elementary School". District of Columbia Public Schools. Retrieved April 13, 2019. ^ " Middle School Boundary Map" (2016-2017 School Year). District of Columbia Public Schools. Retrieved on May 27, 2018. ^ " High School Boundary Map" (2016-2017 School Year). District of Columbia Public Schools. Retrieved on May 27, 2018. ^ Fitzpatrick, Edward A.; Nevils, William Coleman (January 1936). "Miniatures of Georgetown, 1634 to 1934". The Journal of Higher Education. The Journal of Higher Education, Vol. 7, No. 1. 7 (1): 56–57. doi: 10.2307/1974310. JSTOR 1974310. ^ "Red Square". Archived from the original on September 29, 2007. Retrieved July 24, 2007. ^ George, Hardy (October 1972). "Georgetown University's Healy Building". The Journal of the Society of Architectural Historians. Journal of the Society of Architectural Historians, Vol. 31, No. 3. 31 (3): 208. doi: 10.2307/988766. JSTOR 988766. ^ " Hours & Locations". District of Columbia Public Library. Retrieved on October 21, 2009. ^ "Georgetown Neighborhood Library History". DC Public Library. Retrieved January 8, 2016. ^ "Georgetown Library Opened Oct. 18, 2010". DC Public Library. Retrieved January 8, 2016. ^ "The Peabody Room at the Georgetown Neighborhood Library". DC Public Library. Retrieved January 8, 2016. ^ Ecker 1933, p. 39. ^ Ecker 1933, p. 53. 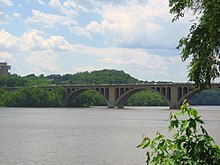 ^ Weiss, Eric M., "Public Works - Oldest Bridge Reopens", Washington Post, Thursday, May 17, 2007, page B-5. ^ Schwieterman, Joseph P. (2001). When the Railroad Leaves Town: American Communities in the Age of Rail Line Abandonment, Eastern United States. Kirksville, Missouri: Truman State University Press. pp. 117–118. ISBN 978-0-943549-97-2. ^ Schrag, Zachary (2006). The Great Society Subway. The Johns Hopkins University Press. pp. 155–156. ^ "Schedule: Washington D.C. Circulator". Retrieved February 1, 2019. ^ "NHL nomination for Georgetown Historic District". National Park Service. Retrieved May 1, 2017. ^ "IBM Archives: Tabulating Machine Co. plant". www-03.IBM.com. January 23, 2003. Retrieved December 30, 2017. ^ "Sea Catch Restaurant & Raw Bar". SeaCatchRestaurant.com. Retrieved December 30, 2017. ^ "Church History". Georgetown Lutheran Church. Archived from the original on May 10, 2008. Retrieved April 6, 2008. ^ "History". Georgetown Presbyterian Church. Archived from the original on April 9, 2008. Retrieved April 6, 2008. ^ ???. "Washington, DC--Oak Hill Cemetery". cr.NPS.gov. Retrieved December 30, 2017. ^ "National Park Service - We're Sorry". NPS.gov. Retrieved December 30, 2017. ^ "Tudor Place - Historic House & Garden". TudorPlace.org. Retrieved December 30, 2017. ^ "HugeDomains.com - DumbartonCourt.com is for sale (Dumbarton Court)". DumbartonCourt.com. Retrieved December 30, 2017. ^ a b National Park Service. Washington, D.C. National Register of Historic Places: Volta Laboratory & Bureau, National Park Service, U.S. Department Of The Interior, Washington. Retrieved from NPS.gov website December 2009. ^ "30 Years: Rabbi Philip Rabinowitz - a Commemoration and Remembrance" (PDF). Retrieved December 15, 2014. ^ "Local Connection: Elizabeth Taylor's Marriage to VA Senator John Warner Made Georgetown her Home". Patch.com. March 23, 2011. Retrieved December 30, 2017. ^ "The Free Lance-Star - Google News Archive Search". news.Google.com. Retrieved December 30, 2017. ^ Andrews-Dyer, Helena (June 30, 2015). "'The Julia Child House' in Georgetown can be yours for $1.1 Million". Retrieved December 30, 2017 – via www.WashingtonPost.com. ^ Slovick, Matt (October 6, 1999). "D.C. Movies: The Exorcist". The Washington Post. Retrieved May 3, 2010. ^ Truitt, Brian (October 7, 2013). "'Exorcist' creators haunt Georgetown thirty years later". Retrieved June 24, 2014. ^ Dickerson, Justin (April 29, 2003). "'West Wing' Graduates at Georgetown". Newspaper. The Hoya. Archived from the original on November 3, 2017. Retrieved August 16, 2015. Ecker, Grace Dunlop (1933). A Portrait of Old Georgetown. Garrett & Massie, Inc.
Gutheim, Frederick Albert; Lee, Antoinette J. (2006). Worthy of the Nation: Washington, DC, from L'Enfant to the National Capital. Johns Hopkins University Press. Lesko, Kathleen Menzies; Valerie Babb; Carroll R. Gibbs (1991). Black Georgetown Remembered : A History Of Its Black Community From The Founding Of "The Town of George". Georgetown University Press. ISBN 9781626163263. OCLC 922572367. Mitchell, Mary (1983). Glimpses of Georgetown: Past and Present. The Road Street Press. Historical Overview of Georgetown, from the Georgetown Partnership. King, Leroy O. 100 Years of Capital Traction - The Story of Streetcars in the Nations Capital, Taylor Publishing Company, Dallas, Texas, Third printing, 1989, ISBN 0-9600938-1-8. Georgetown Historic District, National Park Service. 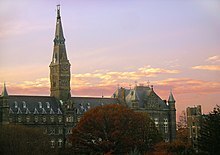 Wikimedia Commons has media related to Georgetown, Washington, D.C..
Wikivoyage has a travel guide for Washington, D.C./Georgetown. "Georgetown, a former city in the District of Columbia" . Collier's New Encyclopedia. 1921. "Georgetown. I. A port of entry of the District of Columbia" . The American Cyclopædia. 1879.